In February 1784 Crosbie announced his intention of making a balloon flight from Dublin to London, and he spent the year developing his ‘aerial chariot’. He was a showman, but he had support from some Trinity academics and from influential patrons such as the viceroy, the duke of Rutland, Lord Charlemont and the duke of Leinster. 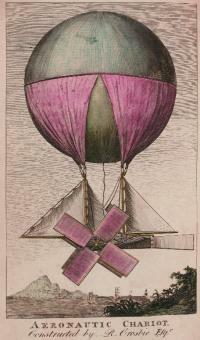 He stressed that he had devised a way of controlling the balloon in flight so that it would not be subject to the wind. The device that he first displayed to the public had masts, sails, a sort of propeller or moulinet and a rudder. Similar designs were circulating in Europe, but this particular one was probably original to Crosbie. His actual flights were made in what he called a ‘flying barge’, which was much simpler, with ballast as the only means of control. After two failed attempts, Crosbie finally achieved his aim of being the first person to ascend in a balloon in Ireland on 19 January 1785. Newspapers recorded crowds of at least 20,000 in Ranelagh (the Freeman’s Journal made the exaggerated claim that there ‘could not be less than 150,000 spectators’). Even Peg Plunket was among the well-wishers on the day (see sidebar). Crosbie showed signs of acute anxiety during the preparations—with good reason, as he could ill afford to disappoint the volatile crowd again. From early morning, hydrogen was generated by combining sulphuric acid, water and iron filings or zinc. It took hours to inflate the balloon, testing the patience of the crowd, but lift-off was finally achieved at about 2.40pm, when ‘he mounted awfully majestic, while the air resounded with the shouts, the prayers, the admiration of the delighted multitude’. Ever the exhibitionist, Crosbie was dressed in a robe of oiled silk lined with white fur, his waistcoat and breeches were made of quilted satin, and he wore Moroccan boots and a Montero cap made from leopard skin. After ten minutes or so, Crosbie released a valve to allow him to descend safely on the North Strand, because a sea crossing would have been too dangerous. An ecstatic crowd carried him shoulder high in his gondola, with the balloon floating over it, to the home of Lord Charlemont in Rutland Square (now the Hugh Lane Gallery in Parnell Square). The next day he received a gift of £200 from the viceroy, which went some way towards covering his costs; he claimed to have spent £500 and raised only £100 in advance subscriptions. Crosbie’s next attempt was in May 1785, and the location was Palatine Square, Royal Barracks (now Clarke Square at the National Museum, Collins Barracks). Crosbie mischievously fixed the flight for Ascension Thursday, but bad weather forced another cancellation. His former ardent supporter, the Freeman’s Journal, now called him ‘a balloon schemer’ and criticised him for ‘rendering the metropolis idle day after day’. Crosbie tried again a few days later and vowed that he would ‘either ascend or die in the attempt’. 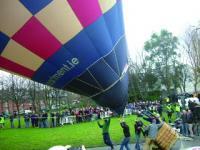 There were chaotic scenes as the balloon was being prepared and Crosbie (6ft 3in. in height and overweight) eventually had to accept that he was simply too heavy to be lifted in the basket. Richard Maguire, a young Trinity student, volunteered to replace him and the balloon headed towards the coast. Maguire managed to puncture the balloon and came down in the sea about nine miles north-east of Howth. He was rescued by a group of balloon-chasers, including Lord Henry Fitzgerald, brother of Lord Edward. The duke and duchess of Rutland waited on shore to welcome Maguire, and he became the hero of the hour. He was fêted in the city, awarded a medal by Trinity College, received a commission in the army and was knighted by the viceroy. These exceptional tributes for a last-minute substitute must have been galling to Crosbie, but he was not deterred. Crosbie made one last ascent in Dublin, from Leinster Lawn on 19 July 1785. The duchess of Rutland cut the rope releasing the balloon, and it bounced a little across the fields near Merrion Square but then rose to a great height and travelled out to sea. Crosbie came in sight of the Welsh coast, ecstatically proclaiming that ‘it was such as to make me risk a life to enjoy again’. But conditions became turbulent and he was soon in difficulty and in the water. A rescue boat had followed his course, and Crosbie put on his cork jacket and calmly awaited rescue. He returned to a rousing welcome in Dublin—but, significantly, no knighthood. Crosbie’s last flight was from Limerick in April 1786, and it seems that it was a display for the public with no particular destination in mind. He spent over three hours in flight over the Shannon estuary, and was relaxed enough to enjoy a meal and a bottle of wine. He landed in a field near Newmarket-on-Fergus, close to today’s Shannon Airport, appropriately. The flight was funded by local subscriptions, but Crosbie still sustained a personal loss of £172—equivalent to approximately Ä12,000 today. These expenses no doubt explain why there were no more recorded flights by him. 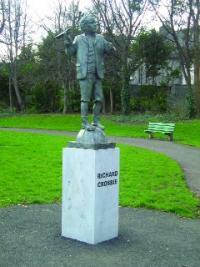 Commemorative statue by sculptor Rory Breslin in Ranelagh Gardens. 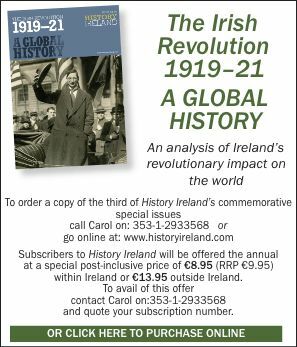 Bryan MacMahon’s Ascend or die: Richard Crosbie, pioneer of balloon flight has just been published by The History Press, Ireland.